President Monson, may I claim a moment of personal privilege? As the first of the Brethren invited to speak following your singular message to the Church this morning, may I say something on behalf of all your Brethren of the General Authorities and indeed on behalf of all the Church. 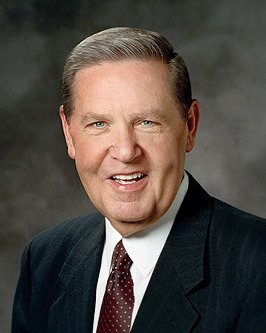 Of the many privileges we have had in this historic conference, including participation in a solemn assembly in which we were able to stand and sustain you as prophet, seer, and revelator, I cannot help but feel that the most important privilege we have all had has been to witness personally the settling of the sacred, prophetic mantle upon your shoulders, almost as it were by the very hands of angels themselves. Those in attendance at last night’s general priesthood meeting and all who were present in the worldwide broadcast of this morning’s session have been eyewitness to this event. For all the participants, I express our gratitude for such a moment. I say that with love to President Monson and especially love to our Father in Heaven for the wonderful opportunity it has been to be “eyewitnesses of his majesty” (2 Peter 1:16), as the Apostle Peter once said. In general conference last October, I said there were two principal reasons The Church of Jesus Christ of Latter-day Saints is accused, erroneously, of not being Christian. At that time I addressed one of those doctrinal issues—our scripturally based view of the Godhead. Today I would like to address the other major doctrine which characterizes our faith but which causes concern to some, namely the bold assertion that God continues to speak His word and reveal His truth, revelations which mandate an open canon of scripture. One Protestant scholar has inquired tellingly into the erroneous doctrine of a closed canon. He writes: “On what biblical or historical grounds has the inspiration of God been limited to the written documents that the church now calls its Bible? … If the Spirit inspired only the written documents of the first century, does that mean that the same Spirit does not speak today in the church about matters that are of significant concern?” We humbly ask those same questions. Please do not misunderstand. We love and revere the Bible, as Elder M. Russell Ballard taught so clearly from this pulpit just one year ago.6 The Bible is the word of God. It is always identified first in our canon, our “standard works.” Indeed, it was a divinely ordained encounter with the fifth verse of the first chapter of the book of James that led Joseph Smith to his vision of the Father and the Son, which gave birth to the Restoration of the gospel of Jesus Christ in our time. But even then, Joseph knew the Bible alone could not be the answer to all the religious questions he and others like him had. As he said in his own words, the ministers of his community were contending—sometimes angrily—over their doctrines. “Priest [was] contending against priest, and convert [was contending] against convert … in a strife of words and a contest about opinions,” he said. About the only thing these contending religions had in common was, ironically, a belief in the Bible, but, as Joseph wrote, “the teachers of religion of the different sects understood the same passages of scripture so differently as to destroy all confidence in settling the question [regarding which church was true] by an appeal to the Bible. Clearly the Bible, so frequently described at that time as “common ground,” was nothing of the kind—unfortunately it was a battleground. One other point needs to be made. Since it is clear that there were Christians long before there was a New Testament or even an accumulation of the sayings of Jesus, it cannot therefore be maintained that the Bible is what makes one a Christian. In the words of esteemed New Testament scholar N. T. Wright, “The risen Jesus, at the end of Matthew’s Gospel, does not say, ‘All authority in heaven and on earth is given to the books you are all going to write,’ but [rather] ‘All authority in heaven and on earth is given to me.’ ” In other words, “Scripture itself points … away from itself and to the fact that final and true authority belongs to God himself.” So the scriptures are not the ultimate source of knowledge for Latter-day Saints. They are manifestations of the ultimate source. The ultimate source of knowledge and authority for a Latter-day Saint is the living God. The communication of those gifts comes from God as living, vibrant, divine revelation. In a sense Joseph Smith and his prophetic successors in this Church answer the challenge Ralph Waldo Emerson put to the students of the Harvard Divinity School 170 years ago this coming summer. To that group of the Protestant best and brightest, the great sage of Concord pled that they teach “that God is, not was; that He speaketh, not spake.” I testify that the heavens are open. I testify that Joseph Smith was and is a prophet of God, that the Book of Mormon is truly another testament of Jesus Christ. I testify that Thomas S. Monson is God’s prophet, a modern apostle with the keys of the kingdom in his hands, a man upon whom I personally have seen the mantle fall. I testify that the presence of such authorized, prophetic voices and ongoing canonized revelations have been at the heart of the Christian message whenever the authorized ministry of Christ has been on the earth. I testify that such a ministry is on the earth again, and it is found in this, The Church of Jesus Christ of Latter-day Saints.In our heartfelt devotion to Jesus of Nazareth as the very Son of God, the Savior of the world, we invite all to examine what we have received of Him, to join with us, drinking deeply at the “well of water springing up into everlasting life,”these constantly flowing reminders that God lives, that He loves us, and that He speaks. I express the deepest personal thanks that His works never end and His “words … never cease.” I bear witness of such divine loving attention and the recording of it, in the sacred name of Jesus Christ, amen.